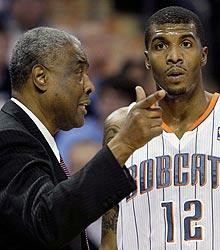 Charlotte Bobcats coach Paul Silas shoved 6-foot-10 forward Tyrus Thomas after a postgame screaming match Sunday night, league sources told Yahoo! Sports. Several players intervened immediately and separated the coach and player, and no punches were thrown, sources said. Silas, 68, had been incensed with Thomas chatting with some Boston Celtics players on the court, and lashed out at him in the losing locker room afterward. Eventually, Thomas snapped back at Silas, and the coach warned him to say no more or risk a suspension. Once Thomas stood up, Silas pushed him toward his locker stall, sources said. Bobcats president of basketball operations Rod Higgins met with Silas and Thomas, and both have been fined, a source said. "There was an incident," Higgins told Y! Sports. "We handled it internally and talked to both the player and the coach and moved on. End of story." Thomas played 20 minutes Monday night in a loss to the New Orleans Hornets, the Bobcats' 17th straight. Charlotte has spiraled to a 7-53 record, and the Boston loss had been especially embarrassing for Silas, who played for the Celtics during his career. The Celtics sat out Paul Pierce, Kevin Garnett and Ray Allen, and still won easily.